Scion's Rural Fire Research Team have modified and reproduced the Fire Weather Index Tables for NZ (third edition). Copies of this publication are available from Scion publications using the order form. These FWI tables are priced at $25 + postage. 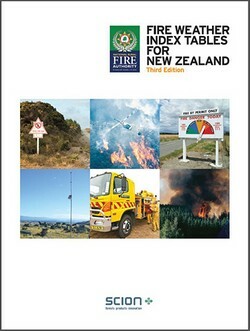 This publication represents the third New Zealand version of tables for calculating the six standard components of the Fire Weather Index System. This third version includes changes to the Initial Spread Index (ISI) table, capturing an updated wind speed-ISI relationship for high wind speeds (>40 km/h). This brings the FWI tables in-line with ISI values calculated within the Fire Behaviour Prediction (FBP) System. Minor revisions have therefore been made to Table 7 (for determining ISI from wind speed and FFMC) to avoid differences being obtained between ISI values calculated using the FWI and FBP systems. This latest edition also includes further improvements to table design to improve their utility. Users should note that this most recent change to the determination of ISI values will affect the continuity of fire weather records. Values created previously from manual calculations for days with high winds speeds (>40 km/h) will differ from those determined using this latest version of the FWI tables. However, the number of days affected is likely to be low in most locations.